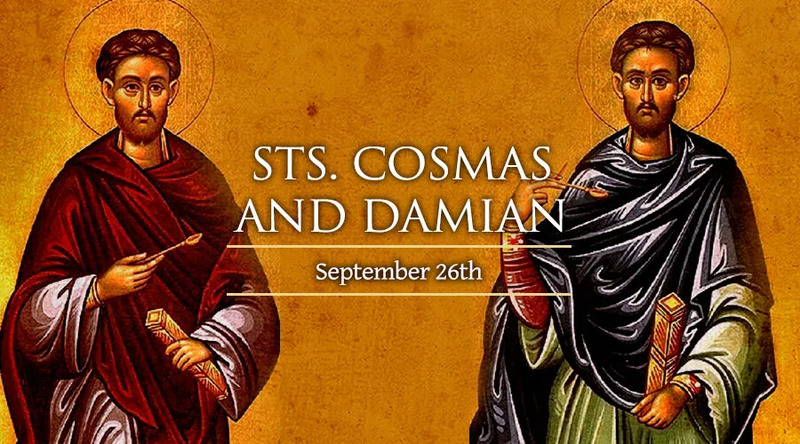 Saints Cosmas and Damian were twins born to Christian parents in Arabia, in the third century. They lived in the region around the border between modern day Turkey and Syria. They were physicians who were renowned for their skill as well as their refusal to charge for their services. Their charity and Christian witness won many converts to the faith and earned them a place of prominence in the Christian communites of Asia Minor. Therefore, when the Diocletian persecutions began in the latter half of the third century they were of some of the first to be sought out for execution. In 287, they were captured and ordered to deny their faith in Christ. They refused and underwent a series of tortures, including Crucifixion, from which, miraculously, they remained unscathed. The torturers, weary of what they realized was the impossible task of forcing apostasy from their mouths, finally beheaded them both. They are invoked in the Canon of the Mass and the Litany of Saints.